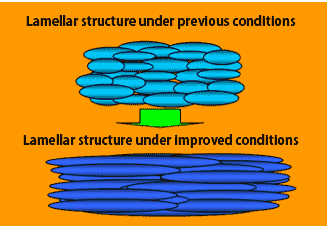 In sputtering equipment, it is important to improve yield by generating fewer particles during coating and improve productivity by using an adhesion-preventing plate with a longer life in the chamber. To achieve this, Toshiba Materials has developed SLR spraying technology that reduces particles by achieving extremely low surface roughness on the parts, and PDM spraying technology that lengthens the life of parts by creating the ideal surface structure. Good adhesion of coating, preventing dust. 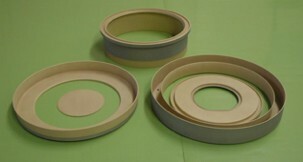 No cracking or peeling of coating caused by heat cycle. Minimal wear, enabling ongoing use of parts. Enables uniform surface roughness and coating thickness, even on parts with complicated shapes. Production lines for semiconductors, LCDs, magnetic recording equipment, etc. VTR drums, speakers, induction cooktops, hot plates, etc. 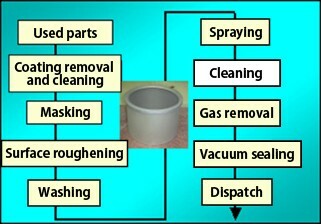 HRG spraying is a process in which rough, flat particles are layered and a smooth surface and undulation-based coating are formed to reduce the particle count and extend the life of the parts. HAS spraying is a process in which the bonding between the particles of the sprayed coating is strengthened and the coating is formed in a way that inhibits protrusions during spraying, reducing the particle count and extending the life of the parts. 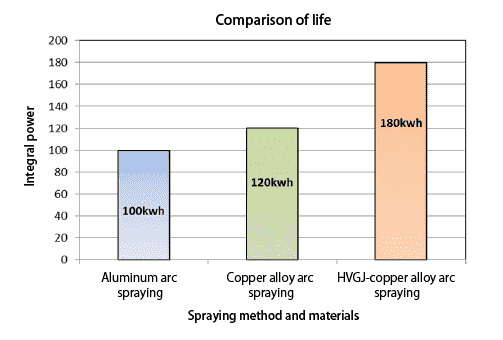 In HVGJ spraying, ultra-fine particles are sprayed at a high speed, forming a smooth spray coating. 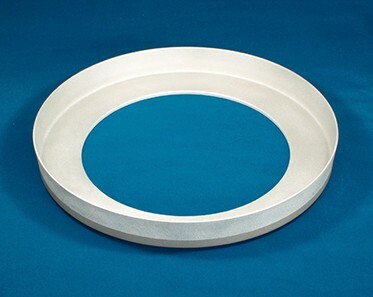 Toshiba Materials uses a high-velocity solid particulate deposition method to achieve previously impossible ceramic coatings. 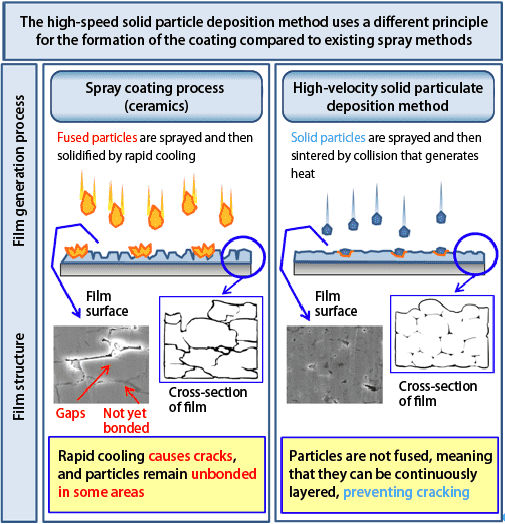 The high-velocity solid particulate deposition method is a form of technology that sprays the material by ultrasound and fuses the surface of the material instantaneously by collision energy to form the coating. This achieves a coating with almost none of the micro-cracks that occurred in the plasma spraying method used previously. Forms a ceramic surface with outstanding corrosion (plasma) resistance, heat resistance (heat dissipation) and insulation performance.